People seem to have more wrong ideas about San Francisco beaches than there are seagulls at Fisherman's Wharf. Let's start by getting the facts straight. Most often, people think all California beaches are like the ones you see on Baywatch, on television or in the movies. In fact, none of those iconic beach scenes are set in San Francisco. The City by the Bay is almost 400 miles north of the sunny, idyllic Los Angeles beaches where they were filmed. The water is colder in San Francisco, and it's often foggy. In fact, you're more likely to find people at San Francisco beaches dressed in sweatshirts than in swimsuits. Nevertheless, a few San Francisco beaches are noteworthy and good for a visit when the weather is sunny or for a sunset stroll any day. Below are the best San Francisco beaches listed by type and interest to help you choose the best one for you. If you want to have a beach bonfire, go to Ocean Beach. An evening on the beach is a fun thing to do in San Francisco. Bring your firewood and dress warmly. For the kids, try Rodeo Beach. Kids love the pebbly beach here, unique among San Francisco Beaches. Ocean Beach is also fun, and it's one of the best places in San Francisco to fly a kite. To watch people, all kinds of them, go to Baker Beach. Enjoy the odd mix of families, fishermen, and nudists who co-exist so peacefully here. Surfing is best at Ocean Beach. It's not recommended for the drop-in surfer who doesn't know how to handle the rip tides and undertow, but an unusually hardy group of surfers can be seen here almost any day. The best clothing optional spot is Baker Beach. A mixed group of folks takes it all off here on a regular basis. On weekends, there's quite a crowd. Go to the beach like a local at tiny China Beach. Tucked below the exclusive Seacliff neighborhood, this small beach is better known to locals than tourists, and some say it's one of the best places for ocean swimming in the San Francisco area. To watch birds (the feathered kind), try Rodeo Beach. Located in the Marin Headlands just north of the Golden Gate Bridge, Rodeo is near a fresh-water lagoon favored by the feathered visitors. 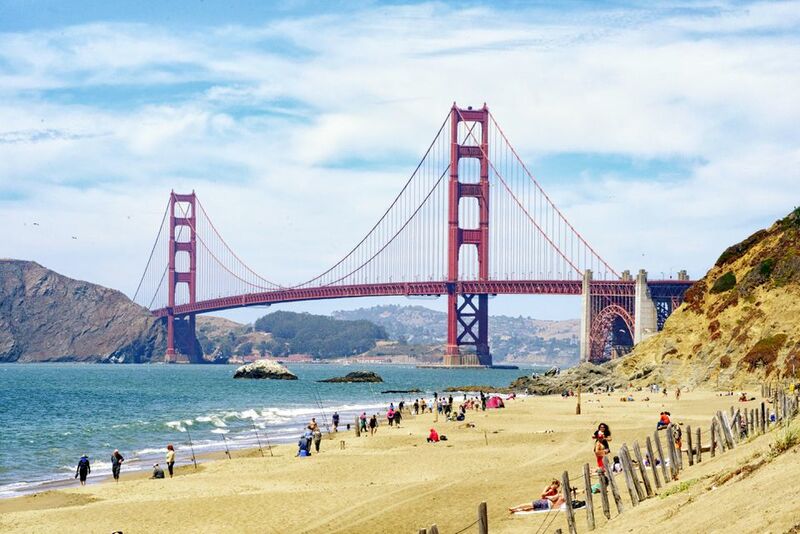 We polled almost 12,000 of our readers to find out which San Francisco beach they like best, and Baker Beach was the winner by a landslide, with 44% of the votes. Next was Ocean Beach at 22%, China Beach at 18%, and Rodeo Beach at 13%. In a word: "fuhgedaboudit" (that's forget about it in case you don't speak New York/New Jersey). You won't find a single place to pitch a tent at a San Francisco beach. In fact, places to camp at any Northern California beach are scarce, but you can find beachfront campgrounds along the NorCal coast. As mentioned in the beginning, the Beach Boys weren't quite telling the truth when they crooned about West Coast California sunshine. In fact, they were likely thinking about Southern California even though they didn't say so. Here's what happens in San Francisco in the summer that makes the beaches significantly less sunny than many visitors expect. It starts when central California gets hot. The air rises. That pulls cooler, wet air off the ocean and brings it inland. If you're lucky, the fog and low clouds may disappear, but sometimes the sun may not come out until mid- to late-afternoon. And it might not make it all. Don't be fooled, though. Use sunscreen even on these overcast days because the skin-burning rays go right through the clouds and fog.